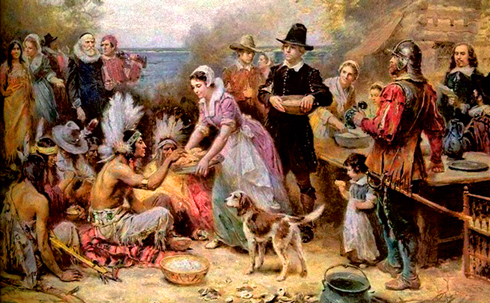 (FinalCall.com) - Family gatherings around massive feasts, excessive shopping sprees, and expressions of gratitude are the traditional things associated with Thanksgiving but a dark history of atrocities and exploitation imposed on Native Americans and enslaved Africans still remains hidden, indigenous activists say. —–Student Minister Abel Muhammad, Latino representative of the Nation of Islam, who is of Mexican descent. 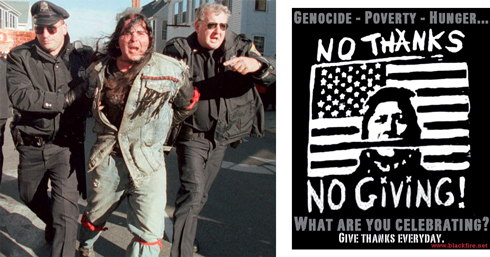 This year’s 43rd annual Day of Mourning, dedicated to political prisoner Leonard Peltier, is Nov. 22 in Plymouth, Massachusetts. The American Indian Movement leader is serving two life sentences for killing two FBI agents on the South Dakota Pine Ridge Indian Reservation. He was convicted in 1977. 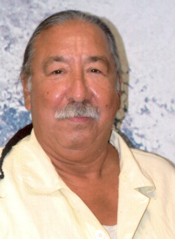 Mr. Peltier and his supporters have long maintained he is innocent and framed by the FBI. “Given the history of the invaders as they came to this land for gold, for glory and in their idea for God ... they tried to stomp out anything that wasn’t White or that was connected to the earth that they couldn’t control. So they exterminated many of my people, then brought my African relatives so they can continue doing their bidding,” said Hector Perez Pacheco of the Aztlan Mexica Nation Harmony Keepers. It is a warrior society dedicated to protecting Native American sacred ceremonies. Greed was the European’s motivation then and now but though their land may be occupied, Native peoples still maintain their sovereignty whether others recognize it or not, he declared. “It’s all about money. It was when they came and it still is about money, not to maintain and survive but to exploit and destroy the ability for others to survive,” Mr. Pacheco continued. One solution is to return to history to build people’s consciousness, he said. Even with broad access to the truth through historians and internet research, old attitudes and ideas about what really happened to Native Americans and the truth of Thanksgiving still prevail, said Nation of Islam Student Minister Abel Muhammad. Misinformation and outright lies have plagued people’s thinking for centuries, but things must change now, he said. “Even though we know of the atrocities committed against the indigenous people, too little is being done to educate, acknowledge, and most importantly, correct the attitudes and thinking that led to the celebration of the genocide of the indigenous,” Mr. Muhammad stated. Indigenous peoples must gain a true knowledge of themselves, then unite and correct those lies and myths that helped to make the “thanksgiving” lie acceptable, said the Latino representative of the Nation of Islam, who is of Mexican descent. “The false images of savage Indians must be countered by their natural brilliance because after all, it wasn’t savages who taught the White man how, when and what to plant for food to survive in the Western hemisphere,” he noted. With this year’s 43rd commemoration of the National Day of Mourning, Mr. Muhammad will be grateful for his ancestors’ sacrifice, culture and tradition, particularly that of great American Indian activist Russell Means, who died on Oct. 22. “As Brother Russell Means said, ‘Look around you. You already have nothing! You experience the worst poverty, the worst health, the worst environmental problems, the worst of everything, plus they have stolen your territory, your freedom, and your self-respect. Wake up!’ That’s what our people need, and perhaps our brother going to the ancestors can be a base for us to unite and the wake-up call we needed,” Mr. Muhammad said. Native Americans should acknowledge their roots but not in some cheap way trivializes the real value of knowing their history as indigenous people, but a real knowledge of themselves, he said. Having a day to give thanks is an ancient tradition in most cultures, not just for Native Americans, according to Mark Anquoe of the International Indian Treaty Council and American Indian Movement. “Naturally, people feel the need to give thanks for what they have. At the same time, we should be most thankful that we still find the spiritual strength to continue the struggle for justice and for our people,” Mr. Anquoe said. First Europeans were taking land for agriculture but now the notion of resources has changed to coal, uranium and oil, Mr. Anquoe noted. While those ancient struggles evolve or may look a little different, they never go away, he said. “They’re still using African Americans as slave labor by pushing everyone into the prison industrial complex, which is a current form of slavery. So you still have the theft of land and use of slave labor,” Mr. Anquoe told The Final Call. From Europeans enslavement and oppression of both Native Americans and Blacks, a sacred relationship formed and both groups must nurture it for a better future for their children, he said. If not, the false legacy of long lines and mass spending on Black Friday, the day after Thanksgiving and official opening of the holiday shopping season, will prevail. Credit card spending during this time of the year leads to massive debt as Black Friday spending hit a record $52 billion in 2011, according to a National Retail Federation survey. The human costs of the Black Friday shopping frenzy have also grown. Black Friday fights are becoming more common, and deadly. A woman pepper sprayed customers, including children, at a Walmart in San Fernando Valley, Calif., to gain an advantage over electronic shoppers during Black Friday last year. A man was shot at a San Francisco Bay Area Walmart in an attempted robbery in 2011. In 2008, a Walmart employee in Long Island, N.Y., died after being trampled by a stampede of hurried shoppers, shortly after doors opened on Black Friday. “This is a period of gratitude but also of financial binging. Black Friday comes along and corporations somehow convince people that they must shop at the mall, as if it’s the law,” said Dr. Boyce Watkins, a professor at Syracuse University, political analyst, and founder of the Your Black World Coalition. Whether eating, drinking or spending too much, people use holidays to binge, he noted. Some view celebrating the holiday as a tradition and don’t mind it but others act in moderation, except where spending’s concerned, he said. The corporate pressure means people spend money they don’t have to buy things they don’t need, ending up deeper in debt and regret, Dr. Watkins said. “Americans are huge consumers. Black people are even huger consumers. Unfortunately, you don’t actually have to have it in order to go out and buy it. You’ll have people that will be deep in debt, behind in their bills, no money in their savings account, but still will be spending like a fool at the malls and that’s a common occurrence and it’s not just a Black thing. It’s a thing. It’s an American thing,” Dr. Watkins said. Diamond companies have convinced people that spending two months’ salary on an engagement ring is the way to prove they love a woman. But there are other more creative ways than succumbing to the pure marketing genius of Black Friday, he insisted. Retailers have manipulated customers so much that consumers are begging them to take their money, said the economist. But the sad part is, people aren’t going to stop, despite the high financial, personal and social costs, he said. “But what you can do is you can encourage people around you to rise above it and reject that. You can’t control what everybody else does but you can control what you do,” Dr. Watkins said.